Around Phuket, Thailand, the diving possibilities are almost endless. World-class dive sites around the most beautiful tropical islands with their white beaches have made Phuket and the whole Thailand the perfect dive destination for both beginners and experts to enjoy a great diving holiday. Phuket diving is some of the finest in whole Asia, whether you choose the local Phuket dive sites or take a liveaboard cruise to exotic areas such as the Similan Islands, Surin Islands or Burma. The diving environments of Phuket range from deep, underwater mountains with breathtaking pinnacles rising up from the sea floor, to shallow pristine coral gardens with dramatic under-sea formations created by huge granite boulders. There are also plunging limestone walls and spectacular underwater caves to be found in many locations in the surrounding areas of Phuket. Thailand's reefs are built of hundreds of species of coral. The large variety of tropical fish, influenced by the ecosystems of both the Indian and the Pacific Ocean are just waiting to be discovered. One of the most impressive sights in the world is the huge variety of giant offshore sea life, abundant in the reefs around Phuket. Silver tip sharks, manta rays and especially whale sharks can be frequently seen at many of the famous dive sites in the Phuket region. To take advantage of all the dive sites in the southwestern part of Thailand it is often necessary to book a liveaboard cruise to some of the islands a fair distance from Phuket, for example the Similan Islands, Surin or the Mergui Archipelago. There are however some great diving opportunities on and around Phuket itself that are easy to reach and relatively inexpensive. It is possible to arrange a dive from a longtail boat hired directly from the beach. These are not the easiest of boats to dive from, but the "cultural experience" should not be missed. This makes diving just a little bit more exciting. The locations on Phuket's western coast offer stunning granite and hard coral topography with exciting caves, canyons and archways. You will find an abundance of reef fish, but also there are large pelagic fish like barracuda and tuna. Deep-water creatures like whale sharks and manta rays can also be observed. One of the best areas is right off the beach in Kata and around the small island off the coast, Koh Poo. Here, the coral reef parallels the bays northern rocky point in shallow waters, which never exceed five or six meters depth. The cost of scuba diving in Thailand is very competitive. Indeed, in many cases the costs are considerably lower than anywhere else in the world. Rates for the various tours obviously vary from destination to destination and from dive center to dive center. It is highly recommendable to check the actual internet home page  nearly all operators of quality have a home page where you can check the actual itineraries, compete the prices and even book online from your desk at home, paying with a credit card. Normally, the price for a day-trip or a liveaboard cruise is understood as having the rental of all equipment included. A complete set of equipment includes tanks, back pack, weights, mask, fins, snorkel, buoyancy compensator (with direct system/power inflator), regulators with submersible pressure gauge, octopus or alternate air source, weight belt, diving knife, diving watch or some sort of underwater timer, depth gauge, compass, gloves and a jump suit, coverall or thin wetsuit (chiefly for protection against coral cuts and sunburn). A diver should take along his diving certification, his log book, personal spare parts and tool kit. Additional equipment available for rent often includes dive computers, pole spears, spear guns (though spear-fishing is not encouraged), lift bags, metal detectors, underwater flashlights, light meters and underwater strobes. If you are a beginner, the right kind of dive education is important and can help to save your live in a critical situation. Recommendable are the world-wide standardized PADI-courses and all the dive operators on Phuket have it in their program. It is even possible to combine a beginners course with a liveaboard trip, but since the most interesting dive sites are in the 20 to 40 meters range and can be affected by tidal current, basic course training can be a difficult exercise. The PADI certification dive courses range from around THB 2.000 for the Introductory Course (1 day) to THB 15.000 for the Divemaster Course (6 to 8 days, or longer) or around THB 40.000 for the complete Instructor Course (9 to 10 days). Phuket and the surrounding areas of the Andaman Sea in general offer some of the most fantastic and magnificent dive sites in the world. The colorful reefs in clear blue water with abundant sea life of all varieties offer visitors and locals the opportunity to enjoy incredible environment in a spirit of community and friendship. 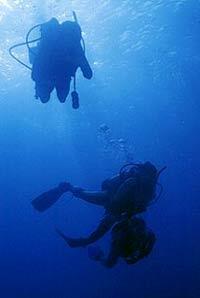 Diving has had a major influence on the tourist industry of Phuket for the past twenty years. Growing numbers of divers from all over the world continue to visit. Because of the popularity of diving of Phuket, a high standard of safety and security is adhered to. Therefore, safety and functional organization are keywords for Phuket's dive community. Thousands and thousands of successful dive-trips through the years confirm the high safety standard. Support services like the Hyperbaric Chamber in Patong help to make diving even more hazard-free on Phuket. Diving safety has improved immeasurably from former days when old equipment and little instruction was the standard. Nowadays state-of-the-art equipment and world class teaching methods is a must. All new diving gear is utilized with safety in mind. A good example of new technology currently in use on Phuket is the "octopus", which has a second mouthpiece, allowing the diver to share his air tank with others. This has dropped the number of accidents to almost zero. All dive operators have done their best to improve dive safety and are certified by at least one of the following organizations: PADI (Professional Association of Diving Instructors), CMAS (Confederation Mondiale des Activites Subaquantiques), NAUI (National Association of Diving Instructors), BSAC (British Sub Aqua Club). In every dive shop on Phuket, PADI-certified open-water diving courses are available. The course includes theory, practice in a swimming pool and finally diving in the open ocean and is the best and safest way to enjoy this wonderful experience. Nowadays, with the modern equipment available, dangers from old inadequate scuba gear are minimal and danger from attacks by sharks or other marine life are surprisingly small. Thailand has not recorded even one single known accident related to sharks!